COCOA BEACH, Florida -- The 2017 Cocoa Beach Pirate Fest will take place at the International Palms Resort located on 1300 North Atlantic Avenue in Cocoa Beach, Florida from Friday, June 16 through Sunday, June 18, 2017. 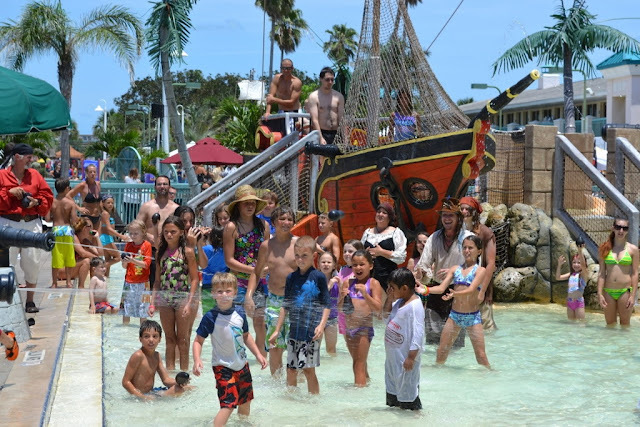 The Cocoa Beach Pirate Festival will feature some great live music and piratical fun including; water cannon battles with over 1,000 cannonball water balloons in a 150,000 gallon pirate-themed kiddie pool, Black Powder Weapon Demonstrations, a Pirate’s Ball on Friday evening for adults 18 and older, A Living History Pirate Encampment, Blackbeard’s Pirate Ship, treasure hunts, arts and crafts and pirate-themed vendors along with food and beverage. If you are lucky, you can even meet a mermaid. Taking place in conjunction with the Pirate Fest and located inside the Dolphin Room at the International Palms is the Florida Pirate Con. Meet world-renowned celebrity artists such as Don Maitz, creator of the Captain Morgan Spiced Rum Character and Michael Noles, who is famous for his decades of work with Disney. Both artists will be signing and selling their artwork. Author, Allen Balogh will also be on hand signing his book, Black Sails 1715. Come hear the tales of treasure hunters who use modern day technology to dig up buried treasure. Learn from the expertise of Carl Fismer, one of the most respected and knowledgeable treasure diving professionals in the world. Meet Captain Mike Daniel, whose most renowned discoveries include that of Blackbeard's lost flagship, the Queen Anne's Revenge and the sunken treasure of Galleon Nuestra Senora de las Maravillas. Last, but not least by any means, Sir Robert F. Marx, an American scuba diver pioneer who has been described as “the true father of underwater archaeology”. For those hungry for knowledge of the sea, don’t miss the lectures and presentations on Saturday by many of these amazing special guests. In addition to the treasure hunting side of things, there will also be plenty of pirate-themed exhibits featuring weapons, clothing and all things piratical at this year’s Florida Pirate Con. Event Hours: Friday 2 p.m. - 6 p.m. Saturday 10 a.m. - 6 p.m. Sunday 10 a.m. - 4 p.m.
Festival Admission is Free - though a voluntary $2.00 “Buck-N-Ear” admission is appreciated.